A Facebook post with a photo of the scene has been turning heads on social media and has been shared more than 22,000 times. The incredible photo shows a six feet deep pit accompanied with a flashy silver BMW. 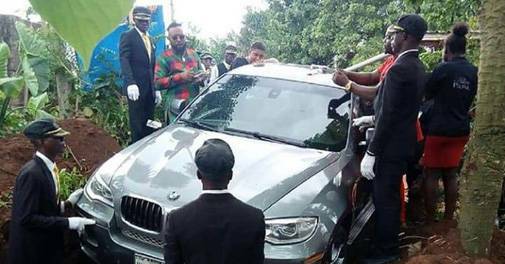 In an incident that has gone viral on social media, a Nigerian man honored his father by burying him in a brand new luxury BMW car costing $66,000. Azubuike, a resident of Anambra, Nigeria, kept the promise he made to his ailing father by burying him in a luxury car which was used as a coffin. The incident has received mixed reactions from netizens. Some have hailed the act as a tribute, few have called it a show off. Locals of the poor Ihiala village in Mbosi, Anambra, were severely displeased and said the money could have been put to better use. "Buy the car for your parent while he is still alive, and bury them with a decent coffin, but this is just being foolish and showing off," commented a Facebook user. Few others on social media even vowed to dig up the luxurious gift and drive off with it.